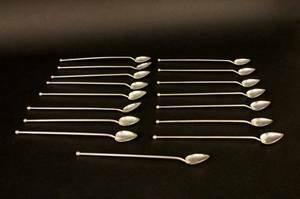 Sixteen matching sterling silver iced tea spoons or stirrers with spade form basins connecting to streamlined shafts terminating with ball ends. 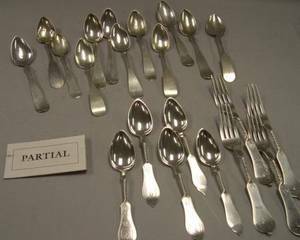 Marked on shaft below ball form "STERLING". Length 8.25 inches. 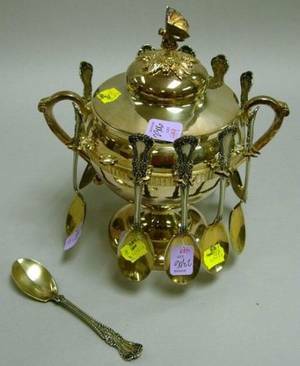 Total weight 6 troy ounces. 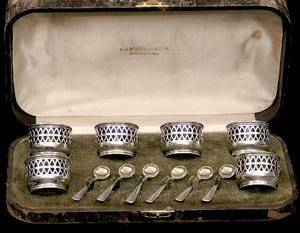 Set of Eleven Sterling Silver Iced Tea Spoons and a Set of Nine Dunne & Co. Sterling Silver Shell-form Demitasse Spoons. 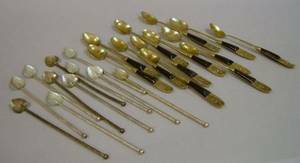 Set of Eleven Sterling Silver Iced Tea Spoons and a Set of Twelve Siamese Horn-Mounted Brass Iced Tea Spoons. 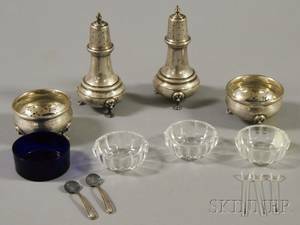 Sterling Silver Revere-style Bowl Set of Four Sterling Silver Spoons and a Set of Four English Sterling Silver Match Urns. 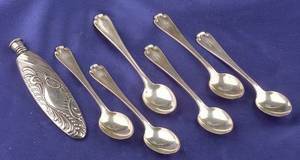 Forty-two Coin Silver Spoons a Set of Twelve Coin Silver Forks and an Assembled Set of Twelve Sterling Silver Teaspoons. 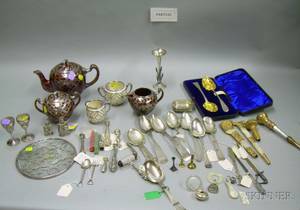 Meriden Silver Plated Nut Bowl and a Wilcox Silver Plated Covered Sugar with a Set of Eleven Sterling Silver Tea Spoons. 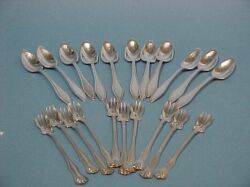 Set of Six Sterling Silver Demitasse Spoons Tiffany & Co.
Set of Eleven Sterling Silver Grapefruit Spoons and a Set of Ten Seafood Forks.